When it comes to screening, sorting and delivering bags to passengers, Wevin understands timing and thoroughness are very important. In today's world, a dependable and efficient baggage handling system is more critical than ever. And that's where our extensive experience in baggage handling systems pays off the most. 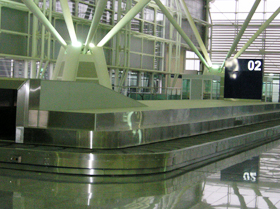 Our Airport Systems has a reputation for providing the most durable and reliable baggage handling systems, in-line EDS conveyors and advanced controls in the industry. Continuous improvement practices apply to all of our products and processes, giving you peace-of-mind that your projects will be completed on time and that your systems will run smoothly. So, building a new terminal or updating an existing one, we have the experts to get the job done without costly interruptions. We also provide skilled maintenance teams that can keep the system running at peak performance around the clock.